In today’s hotly contested active subwoofer field it can be difficult to make a product stand out.” Those are not my words, but the first sentence of British loudspeaker manufacturer B&W’s press release, which introduced their first powered sub- woofer to the U.S. market. It’s a true statement. With the advent of home theater; the subwoofer population has exploded. With everyone from Radio Shed to House of Audio Fabuloso selling row after row of look-alike subs, the average consumer is understand ably confused. If first impressions count for anything, there should be little confusion about the B&W 800ASW Active Sub woofer. Slide it out of its well-designed shipping carton and you’ll find a massive, solid, sleek and well-finished near-cube. It’s larger than it looks in the showroom, but still fairly compact. Its elegant design allows it to be used either upright or on its side; stick-on spikes are provided, preferably to be used after the final location and positioning are determined. The 800’s weight and solidity—no hollow echo here when you wrap the sides with your knuckles—is at least partially the result of its internal Matrix construction, a dense internal network of cross bracing found in all of B&W’s top-of-the-line loudspeakers. B&W 800ASW Powered Subwoofer: forward-firing vented-box subwoofer system with enclosed electronic crossover and power amplifier. Driver: one 12” (300 mm) long throw, magnetically shielded. Frequency response: 17 to 40—135 Hz adjustable. Dimensions: 20” x 17” x 22.8” (HxWxD). The 800ASW’s 12- inch driver is the same one used in B&W’s THX Home Cinema System subwoofers, and the 800 itself is THX certified if used in pairs. As with most powered subs, the B&W offers a variable low-pass filter (with a phase reversal switch) and a fixed, high-pass filter. Speaker-level inputs (and main speaker outputs) are also provided (with excellent-quality binding posts) for use with systems having no line- level means of connection. I always recommend the line-level (RCA jack) inputs be used whenever possible. 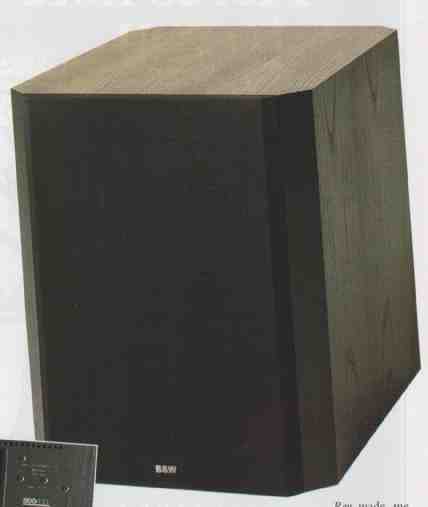 The B&W Active Subwoofer was used in a home-theater system consisting of a Pioneer CLD-D704 laserdisc player, Proceed PAV and Pioneer SP-99D surround processors (the Proceed was used for Pro Logic playback; the Pioneer for AC-3 material), Carver AV-806x multichannel power amplifier, and Atlantic Technology System 350 home THX loudspeakers (minus the Atlantic subs, of course). Cabling was with XLO/VDO inter connects and loudspeaker cable. Experimenting with subwoofer positioning resulted in a placement to the left of the front main loudspeakers, about 2 feet nut from the corner. A second 800 was added later in the review to judge the relative advantage of using two. The first sub was not moved when the second was added, though various positions were tried with the second to obtain a workable setup with two subs operating. Most of the features of the B&W 800ASW may be found in any number of other subwoofers, some of them a lot less expensive. The real question is: How does it perform? I won’t beat around the bush. The 800 is a first-class subwoofer. I was not only blown away by what it could do, but astonished that a single 12-inch driver could shake the house so convincingly. My home-theater room is very large; when you add up all the open, ad joining space, we’re talking about 7000 cubic feet of volume. That, plus the altitude in Santa Fe (which has no effect on frequency response but reduces the effective sensitivity of a loudspeaker by 2 to 3 dB) results in something of a worst-case scenario for subwoofers. The B&W was little fazed by it. It sailed through almost all the torture tracks I could feed it—at high enough levels to rattle the china. It never hiccupped while Apollo 13 took off from the middle of my living room. There was some overhang evident on the deep bass in the final tournament scene from Scorching for Bobby Fischer, and some strain with the falling rock in Aladdin, but neither resulted in serious overload or woofer bottoming (a loud crack that tells you the voice coil has slammed into the back plate). On to more musical material. The drums in the opening title and discovery sequence in 1492, Conquest of Paradise had less tight solidity than with the Velodyne ULD 18 THX (reviewed elsewhere in this issue), but you won’t notice any shortcomings in the B&W without a direct comparison. In fact, for all practical purposes, the B&W appeared to extend as low as the 18-inch Velodyne. The B&W was, however, less tightly defined through the mid and upper bass than the bigger, servo-controlled ULD 18 THX. The 800ASW held up well with AC-3 material. The bomb in the opening sequence of Outbreak did not phase it. It sailed trough the Vietnam scenes in Forrest Gump—helicopters, explosions, the whole nine yards. The new Dolby Digital logo at the beginning of Rob Roy made me leap out of my chair, but the B&W just yawned and asked for the next track, please. Only with the exploding star at the beginning of chapter 7 in Star Trek Generations did minor signs of overload begin to show—at a listening-seat peak level of 109 dB! Like all good subwoofers, the B&W can do more than crack the plaster. Playing music CDs in straight stereo (or the subtle Stereo Surround mode of the Proceed PAV), the 800 produced an extended bottom end with a good combination of tautness and warmth. And on both music and films, I found the single B&W disappeared well into the sonic fabric in my room; it was never clearly “localizable” even though it was several feet to the left of the left front loudspeaker. This quality will, of course, depend heavily on the room and setup. My informal measurements indicated that the output of the B&W subwoofer held up well to about 30 Hz, with measurable (and subtly audible) output to below 20 Hz. Attempts to push the 800 hard with pure tones below about 22 Hz resulted in a loud, distressed chuffing sound. If you feel the need for even more bottom end punch than one subwoofer can provide, you can always add a second 800. I tried such a setup, with both subwoofers driven in mono. Here, the frequency response appeared to extend even lower, though theoretically two identical subwoofers should play louder, not deeper. With a pair of 800s, there was some excess output in the upper bass, which I could not completely eliminate with positioning. Throwing the switch to “audio” on both B&Ws (thus adding the internal low-pass filters in the subs to the low-pass in the processor) helped, as did fiddling with the internal low-pass frequencies (set ting them to minimum). Even better was the use of a parametric equalizer to squelch the upper bass rise (see the side-bar “All Things Equal”). Adding the second 800ASW eliminated the minor overload noted on some material, but at the cost of a more difficult setup and a slightly less tight sound, overall. Although measurable, the added bass extension was not noticed on most program material. And, in a smaller room than mine, it is unlikely that the added power handling of a second subwoofer would add much to the already impressive capabilities of a single 800. However, if you have an AC-3 processor with appropriate bass management capabilities, you might find it beneficial to use one B&W subwoofer for all the normal AC- 3 and Pro Logic bass, while dedicating the second one to the AC-3 low frequency effect (LFE) track. In the course of the three subwoofer reviews in this issue, I used a device called a parametric equalizer to get a feeling for what was going on during setup and to try to improve things. Unlike the more common octave or third-octave types, which boost or cut frequencies over a relatively wide range, a parametric EQ can be zeroed in on a narrow band or even a particular frequency. This is important because most peaks in the bass occur over a very narrow frequency range. I used a Rane FPE 13, which is a 3-band, mono equalizer. 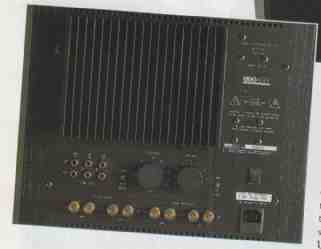 (Rane makes two “home-theater” equalizers and many others aimed at the pro market; the FPE 13 is a professional unit.) It definitely requires test equipment to properly set up such a device; I’ll cover this subject in a future issue. At its best, the B&W 800ASW was less taut-sounding than the Velodyne ULD-18 THX, less self-effacing when little bass was present. The M&K MX- 5000 (also reviewed in this issue) was a hair tighter, about as extended subjectively (though not measurably) as a pair of B&W 800s, with the most satisfying bass crunch of all three. But the B&W 800—even a single one—was less prone to overload than the M&K and more visceral-sounding (especially in pairs) than the Velodyne. All three sub- woofers excelled, and I am not being evasive when I say that my order of preference often changed with the pro gram material. If I ultimately preferred the Velodyne over the others, based on its typical performance with a wide range of both music and films, that is no mark against the B&W. A single 800 (subjectively) goes as low as the Velodyne, handles overloads nearly as well, and costs about half as much. Two B&Ws go lower and handle almost anything, at the cost of a less-controlled mid and upper bass—an effect that very much depends on the room and placement. Two separate B&Ws, at about the same cost as a single Velodyne ULD-18, will give you added placement flexibility, allow for stereo subs (although I am not sold on the importance of this, many audiophiles want it), or for AC-3 bass management, as noted above. Any way you cut it, the B&W 800ASW is a terrific subwoofer.